Sitting around the fire, drinking egg nog with the wee little ones I got to thinking about how the other half lives. More specifically, what do cryptids think about all this merry festiveness? You know, Christmas. Oh, that magical time of year filled with gifts, family gatherings and perhaps even some snow. How boring if you’re anything but human (or maybe an elf). Fortunately, the history of this holiday is filled with gruesome creatures that make the constant surveillance of Santa Claus and his corporatist minion, the shelf loving elf, seem like the most innocent of creations. After all, to be rather honest, there’s something inherently creepy about having a magical being (able to slip in and out of your home undetected) watching you 24/7 to determine whether you’ve been naughty or nice. Fortunately for those on the naughty list, Santa only brings coal if someone’s been bad. There are, however, darker creatures dwelling within the holiday season which would love nothing more than to shove that lump of coal where the sun won’t shine. 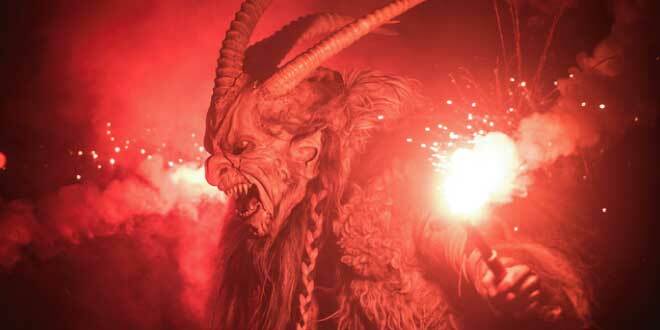 Before becoming a household name as the head monster in the holiday horror movie “Krampus,” this goat-like figure was terrorizing kids in European nations such as Austria and Germany by dishing out punishments for St. Nicholas. Children who were atrocious could expect kidnapping and beatings with switches as their punishment by this scary Santa Claus. Those who were merely on the cusp would find a switch under the tree instead of gifts. In the movie, Krampus is shown with an almost human face. However, this is merely a mask for the terrifying, demonic visage hidden underneath. Krampus has cloven hooves, a long, lolling tongue, goat horns and thick, brownish-black hair and fur covering its entire body. Anthropologists claim the belief in Krampus pre-dates Christianity. His horrifying appearance, combined with his penchant for dishing out punishments, was most likely one of the prime inspirations for our modern day imagery of the Devil. 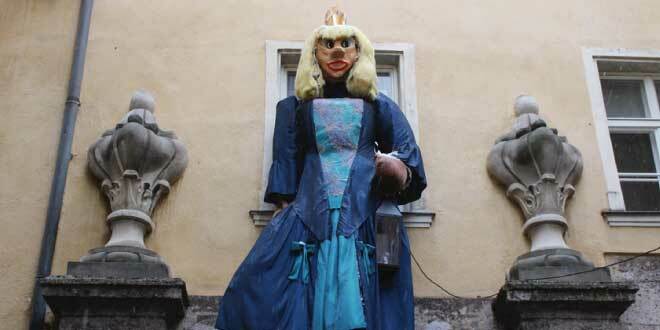 Grýla is an Icelandic ogress with a penchant for doling out unimaginable punishments on naughty children. Instead of allowing Krampus to kidnap and beat unruly or disobedient kids, Grýla steals them, cooks them and then serves them as a meal for herself, the Yule Lads and her Yule Cat (see below). Although they’re trolls, the Yule Lads are Grýla’s children. In total, this evil mother has spawned 72 kids by three husbands and enjoys nothing more than inflicting mayhem and murder. The Yule Lads love breaking things and generally being a nuisance around Christmas time. They’re known to steal from any misbehaving children. Apparently not affecting her ability to land a man, Grýla’s physical appearance is repugnant. From a distance, it’s possible she might be confused with a human, but close up it’s clear this ogress is a six (or more) beer date, at least. Beneath Grýla’s long, bulbous nose, fangs protrude from her lovely lips. In step with ogre fashion, her head’s adorned with a nest of bushy hair. 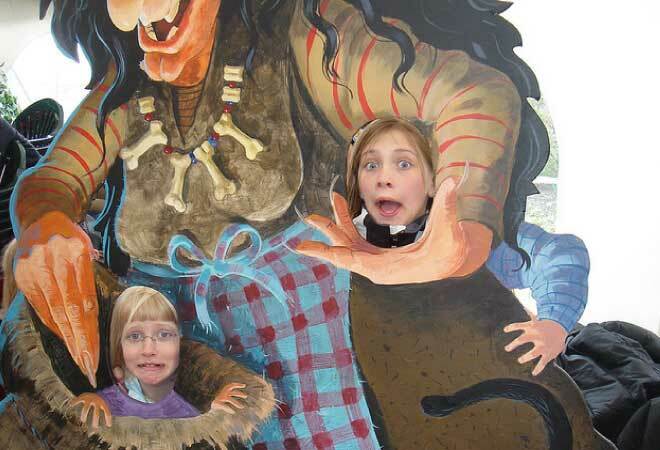 An all-you-can-eat kind of lady, Grýla’s hunger is believed to be insatiable, so it’s not wise for the children of Iceland to make the mistake of disobeying their parents. With an innocent sounding name like Yule Cat, it’s easy to envision a sweet, purring feline bearing gifts during the Christmas season. However, this couldn’t possibly be further from the truth. 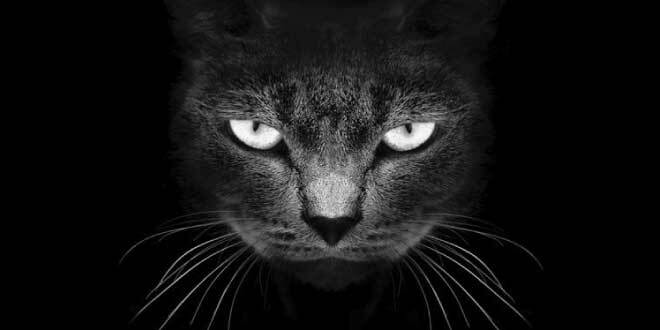 The Yule Cat, known as Jólakötturinn in Iceland, would be better referred to as the Christmas Demon Cat from Hell. Not only does this cat stalk the dreams of Icelandic adults and children but it punishes people unable to afford new clothing. The roots of this legend go back to the 19th century. It’s clear that the Yule Cat, who lives with Grýla, was used as a symbol to inspire people to take pride in a job well-done. However, a demented looking black cat with razor sharp teeth and red eyes stalking the nightmares of the poor unable to offer new gifts showcases a genuinely terrifying level of classism. According to the legend, anyone who hasn’t worked hard enough to afford gifts or clothing for their family and friends will be eaten by the vicious and monstrously large cat. If you were ever worried that cryptids took a break over the holidays, don’t be. Several Christmas monsters are eagerly waiting to pass judgement on you and your children should they cross your path. With all of these gruesome creatures on hand, it’s surprising Christmas became associated with joy and peace. I guess it just had a better publicist. Of course, the threat of being beaten by Krampus or eaten by Grýla just might have been strong enough to convince most people to be good for at least one month out of the year. Of course, the threat of being beaten by Krampus or eaten by Grýla just might have been strong enough to convince most people to be good for at least one month out of the year. Image “Grýla gómar börnin” by Gúnna is licensed under CC BY 2.0; Cropped from original.